We travelled by train to Genoa, which looked like an interesting city, but sadly we only had a couple of hours hanging around the ferry terminal with our luggage before boarding the overnight ferry to Palermo, in Sicily. The trip (eighteen hours long) was sold as a kind of mini-cruise, but most of the facilities on the ship which you might associate with a cruise (swimming pool, hot tub entertainment, hair salon etc) looked as though they hadn't been used in years, so it really wasn't a lot different from a cross-channel ferry. We had a nice stateroom, though, with a window and as Paul wasn't feeling very well, he took the time to sleep and feel sorry for himself. They kicked us out of our room about 4:00pm the next day and just after 5:00 pm we disembarked into Palermo. The docks are in the heart of downtown and you are hit immediately with the sights and sounds and smells of a big city. Palermo is the capital of Sicily and you know it at once. Most of the roads were built for horses or donkeys and now carry two-way car traffic PLUS suicidal bike and scooter riders, all of whom are male, pumped up with testosterone and none of whom wear helmets. Why would they ? They are immortal. They know that - I'm not so sure myself. Makes crossing the road an experience to be remembered. We checked into out hotel, the Porta Felice. It was a modern hotel with all the facilities but not a lot of character. I guess you can't have it both ways, at least not at our prices. We stayed close to the hotel on our first night and dined at a local trattoria before enjoying an early night. Next day, we set out to see what Palermo had to offer. We decided to make use of the "jump-on / jump-off" bus most major tourist cities seem to offer, to at least get a quick overview of the city. We took a break from bus riding at lunchtime and walked back to the Cathedral, built in a style unique to Sicily which combines Norman and Arabic styles in one building. Palermo Cathedral built in the unique Arab - Norman style. Construction began in 1185. The interior, although very large, was less impressive. The Cathedral has a heliometer (solar "observatory") of 1690, one of a number built in Italy in the 17th and 18th centuries. The device itself is quite simple: a tiny hole in one of the minor domes acts as Pinhole camera, projecting an image of the sun onto the floor at solar noon (12:00 in winter, 13:00 in summer). There is a bronze line, la Meridiana on the floor, running precisely N/S. The ends of the line mark the positions as at the summer and winter solstices; signs of the zodiac show the various other dates throughout the year. After lunch, we resumed our tour of the city, including a couple of highlights, the Teatro Politeama Garibaldi and an impressive monument to the Fascist era, the Post & Telegraph office. The next day, we had no firm plans so decided to wander the streets pretty much aimlessly and see what we could find. The first sight we came across was a spectacular fountain, well preserved, but no longer functioning. The fountain, known as the Fontana Pretoria, was purchased by the city in 1573, but was a little to risque for it's era and was dubbed "The Fountain of Shame". A local show window display probably reflects a similarly tasteless view in 2010. Next to the fountain were two small churches - one which charged an admission and one which didn't. We chose the one which didn't and were rewarded with an unexpected explosion of mosaic and fresco color. The next day, our last in Palermo, we had an early start to see another church (technically, a chapel) described as Palermo's premier tourist attraction, the Cappella Palatina. This was designed by Roger II in 1130, it has recently been restored. Unlike the small church we had visited the day before, this was decidely NOT free but at the same time, it was probably in better condition than an any time since it had been built and it is also a jewel, with the walls glittering with dreamy gold. The catacombs turned out to be as creepy and spooky as you might expect. Photographs were not allowed and we didn't break the rules, but we did find some pictures on the internet which are reproduced here. The catacombs were originally reserved for the remains of Capuchin monks, but in time, almost anyone who was rich enough could be interned here. The first monk was placed here in 1599 and the practice pretty much ended in 1837 when the displaying of bodies in this way was outlawed, although it appears that closed coffins may have been placed here more recently. 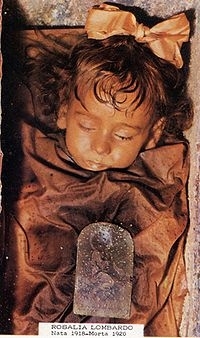 The young girl, Rosalia Lombardo, seems to have been brought by her parents to be embalmed in 1920, but was never removed and she has been here ever since. The remains are strictly segregated, the men from the women, the priests and monks from the professionals. The guide book states that over 8,000 remains are here, but many were lost during a bombing raid during the Second World War. 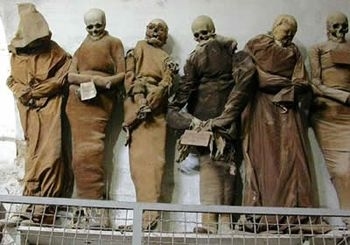 Altogether a weird and creepy place and enough to give anyone nightmares ! And now we had a bus to catch to Catania ! Catania is Sicily's second city and although it does have some buildings and features of interest, we planned to use it mostly as a base to see other places in the area. However, we did spend a couple of evenings walking around the town. The elephant is the symbol of Catania and the statue in the town center, the Piazza Del Duomo, is thought to be from the Roman period, although the fountain in which it sits was built in 1736. The cathedral is dedicated to St Agata and was built in the 12th century, and was then entirely rebuilt in 1600 after the earthquake and the volcano eruption destroyed most of the city. Our hotel in Catania, The Villa Romeo was across the street from the railway station and looked rather unimpressive from the outside, but the lobby was a big improvement and the hotel had a very pretty courtyard in which we could sit and read or have a drink. Next day, we took the train to Taormina, a small town about forty minutes north of Catania. It has a long and rich history and is well known as a hang out for artists and other creative people. At one time, it was a hangout for the Burton's, presumably when they were getting along OK. It's a now a very pretty but very busy little town full of exclusive shops and tourists. Getting to the town has it's challenges. The town is perched high up on a ridge overlooking the sea and the railway station is at sea level. Fortunately, we took the bus to the top but we did walk down later. And to finish our visit, a long a dusty footpath all the way back to the railway station WAY below ! To actually go all around Mount Etna actually requires the use of three different train services, but we'll come that. The first part of our trip was on the main line train from Catania to Giarre. Our plan was to catch an early train and the plan would have worked, but the main line train was forty minutes late and we missed our connection. As a result, we had time to explore another small village, Riposto and actually caught the train from there. As the train set off up the mountain, we had wonderful views of the sea on one side below and lush terraces of lemon, olives and vines on the other, with the volcano always present in the background. As we climbed higher and rounded the mountain, the landscape became more barren and dramatic. We stopped in Randazzo for lunch and to change trains, before continuing our journey around Etna. Waiting to depart from Randazzo, about a third of the way along our journey. Mount Etna as we neared the highest point on the journey. Mount Etna from the south as we ended our journey on the narrow gauge line and transferred to the new metro line for the last few miles. After a busy and exciting day on Mount Etna (or is it Aetna, like the insurance company) we spend the evening resting and packing for our early departure the next day to Salerno and the Amalfi Coast.